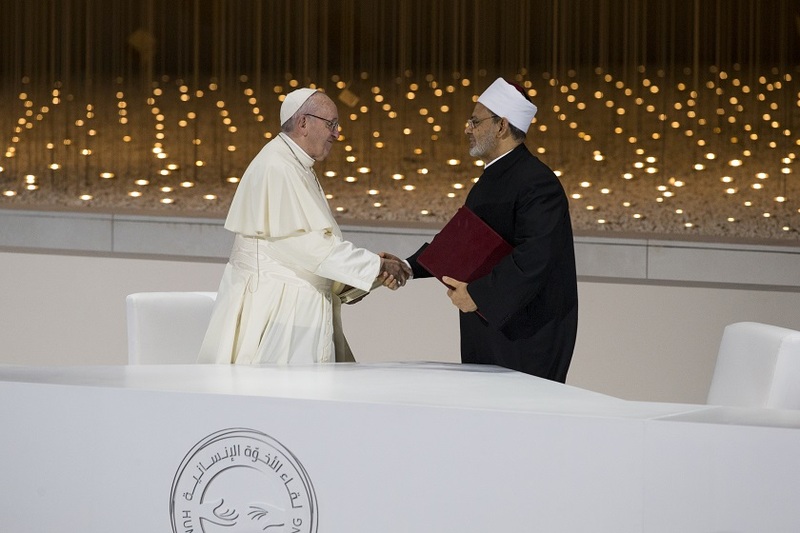 Pope Francis, leader of the world’s Catholics and Sheikh Ahmed al-Tayeb, Head of Islam’s Sunni learning Center Al-Azhar signed the historic Abu Dhabi Declaration on Tuesday during their joint-visit to the UAE. The document, entitled “Human Fraternity for World Peace and Living Together”, aims to see the religious leaders work to create stronger bonds between people in the Middle East through fighting extremism brought on by religious conflicts. Sheikh Mohammed bin Rashid al-Maktoum, UAE Vice President and Prime Minister and Ruler of Dubai Sheikh Mohamed bin Zayed al-Nahyan attended the signing ceremony among other honorable religious leaders. In commemoration of this event, the first ever “Human Fraternity Award – From Dar Zayed” was granted to Pope Francis and Sheikh al-Tayeb by Sheikh al-Maktoum. An official statement highlighted that Sheikh al-Tayeb was honored at the ceremony due to his significant role in promoting highly needed values including moderation and human acceptance in addition to his stand against radical extremism. “You are part of this nation… You are not minorities,” Sheikh al-Tayeb said in his speech. Furthermore, he stressed on his commitment to protect the Christian community in the Middle East and guarantee an integrated community for Muslims in the west. Pope Francis is also renowned for his efforts in endorsing tolerance intensively and rejecting all violence means. He is respected as a moral advocate who respects all people regardless of differences and frequently calls for peace and coexistence. “Hatred, violence or extremism cannot be justified in the name of religion.” Pope Francis stated during the ceremony. He also said that if “humanity cannot work together to build the future, there will be no future”. The ceremony was held on the sidelines of the broader Human Fraternity Meeting, which marks the first ever visit by a Pope to the Arabian Peninsula and is hosted by the UAE Government.